← Is the glass Half Full or Half Empty? At first, many of us will say “NO WAY!” We will think of all the things that we do that are just the opposite of hard heart. The question that begs to be answered is, “What does the text (the Bible) say a hard heart is? First we need to know how the text defines “heart.” The Hebrew word for heart is ‏לֵב‎ lﬁv (phonetically: labe) and it means interior, will, mind – in other words, your innermost being. It is used 600+ times in the Tanakh (Old Testament). The physical location of the heart in the midst of the thorax leads to the interpretation of the heart as being the very center of a person or thing. Thus, the noun is used with the meaning “middle,” as in “the heart of the sea” (Exo. 15:8). and conscience (Isa. 59:13) are centered. One’s intellect is centered here as well, given that knowledge is tied to devotion to Yahweh and his laws (cf. Prov. 1:7). while a mindless person “has no lﬁv” (Prov. 17:16). and belief (2 Sam. 13:33). A defiant or stubborn attitude is expressed by in the imagery of a “hardened heart” (Exo. 7:13). An extension of this concept is a “heart of stone,” one which Yahweh will one day replace with a heart of flesh (Ezek. 11:19). Devotion is expressed as giving “all of the heart” (1 Kings 11:4). Conversely, Yahweh was compelled to destroy humanity because every thought of their hearts was continually upon sin (Gen. 6:5). Indeed, this response to the heart of humans “grieved [Yahweh] to the heart” (v. 6). Repentance is characterized as “returning the heart” (1 Sam. 7:3). A common phrase in Deuteronomy is “with all the heart and soul” (Deut. 4:29), which emphatically declares that we must give all to Yahweh. Normally, I put the text down on the page rather than give verses. To keep this post shorter, I just posted the Hebrew English Dictionary entry as it was without posting the actual verse so you could read it. In some contexts a broken person is one who responds to the prompting of the Holy Spirit in repentance (Ps 51:17; Is 57:15). A brokenhearted person is the opposite of the self-made, hardhearted person. The fundamental difference between these two types of individuals is most evident in their reactions to being confronted with their own sins. The key element is that the brokenhearted person repents. That last phrase: “The key element is that the brokenhearted person repents.” brings King David to mind immediately when he was confronted with His sins by the prophet Nathan. What did King David do? He immediately repented saying: “I have sinned against Adonai!” King David would have been a broken-hearted person. King Saul on the other hand, well, you know how that story goes . . .
51 He got into the boat with them, and the wind ceased. on the contrary, their hearts had been made stonelike. you are not to harden your heart or shut your hand from giving to your needy brother. and lend him enough to meet his need and enable him to obtain what he wants. for then he may cry out to Adonai against you, and it will be your sin. and you are not to be grudging when you give to him. 11 for there will always be poor people in the land. meek and mild” falls short of reality. But Yeshua, like all the prophets, spoke the words of God without fear or favor. He comforted those who were open to him and made repeated invitation to those who opposed him; but when it had become evident that these particular Torah-teachers and Pʾrushim were hardhearted, closed-minded and interested only in confuting or trapping him, he seized the initiative, revealing his accusers for what they were. Was he “unloving” toward them? his within-the-family correction was aimed at making these Jewish brothers of his live up to their high calling (and he partly succeeded; see Ac 15:5, 21:20, 23:6). and they are all zealots for the Torah. one must say the same of all the Jewish prophets from Moses to Malachi. You see, maybe one of the hardest hearts of all is the modern day assemblies – the church and the shul! I know you are defensive and bristling at that statement, so I will exaggerate to unblur the lines for you. I want you to imagine that Yeshua (Jesus) had not come 2000 years ago, and instead, came now – during this time. Would you know Him? Would He be welcome in your homes? In your churches? Before you answer that, let me remind you that Yeshua was a homeless person. “Where can we get enough bread in this wilderness to feed such a crowd?” said the disciples. “How many loaves have you?” asked Jesus. Then Jesus commanded the crowd to sit down on the ground, and took the seven loaves and the fish and gave thanks. And he broke them and gave them to the disciples, and the disciples gave them to the people. And they all ate and were satisfied; and they gathered up seven baskets full of the broken pieces that were left. Those who ate numbered four thousand men, besides women and children. Then Jesus sent the crowds away, and got into the boat and went to the region of Magdala. Thoralf Gilbrant, ed., Harmony of the Gospels: Concerning the Greatest Life Ever Lived, (Springfield, IL: World Library Press, Inc., 1986), WORDsearch CROSS e-book, 173-175.
giving them authority over the unclean spirits. no bread, no pack, no money in your belt. 9 Wear shoes but not an extra shirt. “You see, maybe one of the hardest hearts of all is the modern day assemblies – the church! So let me ask you a serious question . . .
Would you offer YOUR home to some dirty, homeless, hungry duo of itinerant preachers that were telling you to repent of your sins? Or would you send them away? Call the cops on them? Hide your children from them? Let me ask you a tougher one . . .
You see, Multi-million dollar assemblies (churches) that tell people giving to them, is giving to God have missed the mark (sinned). Sure, they may send a small token of what they take in to mission work overseas, but a majority of it goes to pastoral and staff salaries and to building mortgages (over $.75) of every dollar taken in on average! the homeless situation in America testifies against the church every minute of every day! If Yeshua came today, was homeless and living in the streets, few – if any – people in the church would know it . . . or even care! They do this when they build multi-million dollar worship buildings and multi-purpose rooms. They do this when they spend $15,000 dollars on an in-ear monitoring system for the worship team and turn people away on Monday calling the church office looking for help! They do this when they teach and instruct their staff to turn people away – to get them in touch with “help” agencies. I have seen this very thing in most of the churches I have served at and most churches I have visited. It is utterly heart breaking to watch your pastor and the people you serve with raise “Holy hands” on Sunday and have “closed hands” to the poor in our land on Monday through Friday. Sending a few dollars to the missions over seas does NOT negate the absolute apathy that is present in the modern day church towards the poor and homeless in our own land – in our midst! Maybe, that is why Yeshua did what he did. What better way to emphasize the 2nd most important command “Love your neighbor as yourself” than to walk among those He would offer Salvation to and depend on them for mercy and generosity. or needing clothes and provide them? You see, the people on His left – the goats – are the people that ignored the hungry and built multi-million dollar worship assemblies while doing so. The people of the left are the stingy people – the uncaring people – the people with a “closed hand” to the poor and needy among them. They are the churches that turn the poor away on a daily basis . . . They are the people that REFUSED our Master – our King! The text says what ever they refuse to do for the poor and needy, they refused to do for Him! The following verse, regardless of whether they call themselves Christian, or Messianic, or Calvinist or not is startling . . .
No wiggle room here. Have you done what God wants? No ignoring the command and order will matter. You have either done it or you have not. If you theology does not teach this, your theology is WRONG! Throughout the text we are given warnings about being kind, showing mercy, loving our neighbor, helping the needy. The following verse is one that should make you pause for a moment and think about what it is saying – what it is implying . . .
Or you have NOT entertained them . . . maybe your drove right past them and looked the other way! When you pass that homeless man and do nothing . . . When you turn that person in need away from your church or shul and tell them to get help somewhere else. . .
What if it is/was/will be a test by the Father Himself to see if you are a sheep or a goat – a test to see whether your church is among the sheep or the goats?!? Which one would He say YOU are? Would you be on His left with the goats, or on His right counted among the sheep? It is a serious question with serious ramifications – ETERNAL ramifications! Maybe you are unfamiliar with the text here . . .
without giving him what he needs, what good does it do? A guy calls or comes into your assembly – your church looking for help. Instead of helping him, you offer to pray for him that God gives him some warm clothes and some food . . .
Maybe he would have even done a face-palm. You see, regardless of the dogmas and theologies that are taught and accepted out there, trust in Yeshua (faith), without actions (works) will not save you – it is dead! because of actions when he offered up his son Yitz’chak on the altar? Again I ask, Sheep or Goat? A trust that is complete or incomplete? The very word righteousness means alms giving to the poor! You can not be righteous and ignore the poor in your midst, period! How many churches today teach faith alone? Is it any wonder that actions seem optional or not even required to many in the church? Let me ask you an even tougher question, Can you bear good fruit without actions? Yeshua (Jesus) said, “Those who love me, obey my commands!” which also implies that those who do not obey His commands do not love Him . . .
Do you love Him – Do you really love Him? Do your actions match your words? That is His command . . . I know this was a long, hard, and in your face teaching. Be blessed my brothers and sisters and seek His Kingdom first above all else that you do! This entry was posted in Living life Even if . 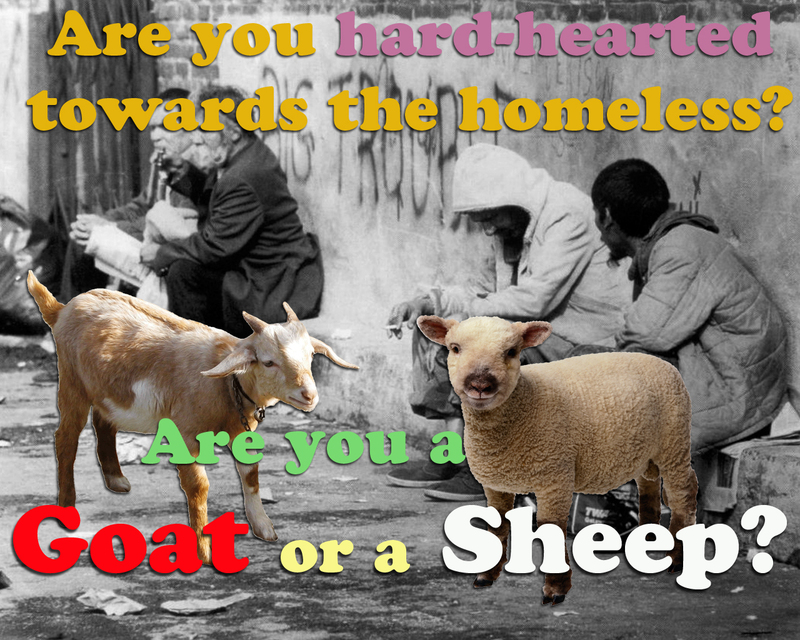 . . and tagged goat, hard heart, hardhearted, homeless, hungry, sheep. Bookmark the permalink.